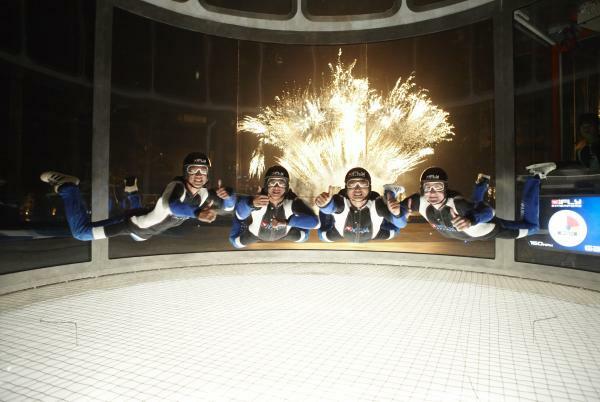 Live your dreams with the world’s largest themed wind tunnel for indoor skydiving Singapore. Spanning 16.5 feet wide and 56.5 feet tall, it is the only wind tunnel with an 18 feet acrylic glass wall that lets you enjoy an unparalleled view of the South China Sea and Siloso Beach while skydiving. And when you take off at night, the awesome fireworks from Sentosa’s Songs of the Sea will leave you breathless. You must weigh less than 120kg (if shorter than 180cm) or 140kg (if taller than 180cm). Call us @ +65 9178 1234 if you exceed the limits. You are at least 7 years old. You must be able to comfortably wear one of our helmets. You have not previously dislocated your shoulder, have no history of back/neck injury or heart problems. You are not under the influence of alcohol or non-prescriptive drugs. You are not wearing a plaster cast. You have signed our indemnity form. Flyers must bring photo ID to check-in prior to flight. Flyers under 18 years old must be accompanied by at least one adult. Minimum 5 (working) days notice to schedule the experience.